A sampling of the day’s mural finds. Top Left: Red Bull Soapbox Race by Weirdocult.com. We didn’t get up in the mountains this weekend. 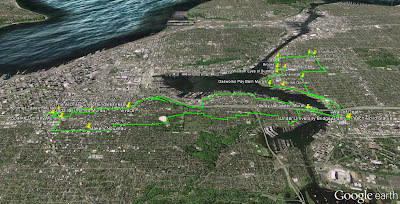 Instead, we went on a 14 mile “urban hike” in Seattle. (That’s about 30,000 steps as calculated by Fitbit.) We walked from Fremont to Capitol Hill and back. Along the way, we had a nice lunch at Bakery Nouveau (Capitol Hill) and a wonderful Italian dinner at Cantinetta. On our hike, we saw some interesting murals, street art, and graffiti. The Architecture of Endlessness by NKO. A mural that is part of the Capitol Hill Wall Project. Eastlake Abandoned Lot (see Street Art in an Abandoned Lot for a view earlier this year) – Happy Halloween! Around Stone Way and N 34th. Sadako Sasaki – Peace Child Statue. Under the north end of the University Bridge. Graffiti and The Wall of Death public art installation. Capitol Hill Murals. Left: Red Bull Soapbox Race by Weirdocult.com at Neumos. Right: Sparkle Donkey Mural – El Burro Esparkalo at E Pine Street and 12th Ave.